Looking for the best Far Cry 5 price on PS4, Xbox One and PC? We don't blame you as it's easily the biggest game of the year so far and the reviews have been pretty darn good since its release. Far Cry 5 is Ubisoft's newest entry to the much-loved open world shooter series and is out now on PS4, Xbox One and PC. 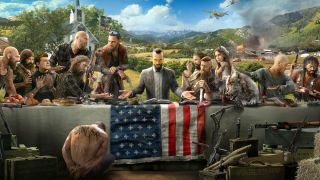 There are currently no official plans to release Far Cry 5 on the Nintendo Switch. Below you'll find the latest prices for Far Cry 5 on PS4, Xbox One and PC. Under those prices you'll find another comparison chart for the Gold Edition of the game along with an explanation of what's inside. What's in the Far Cry 5 Gold Edition? The Gold Edition of Far Cry 5 includes lots of extra content, with the biggest excuse to upgrade over the standard edition being the season pass. This gets you three sets of expansion DLC: Dead Living Zombies, Hours of Darkness and Lost on Mars. You also get Far Cry 3: Classic Edition, bringing the last-gen classic to current-gen consoles for the first time. Other bits of digital content included in Far Cry 5 Gold Edition include a MBP sniper rifle and a bunch of digital deluxe pack content like outfits, weapons and consumable items. At launch, it seems to be a bit cheaper to buy the Gold Edition than the main game and season pass separately. So if you're a series fan and know you'll want to play the expansions too, this is the way to go. If you're not sure, just buy the season pass content digitally at your leisure at a later date if you so desire.